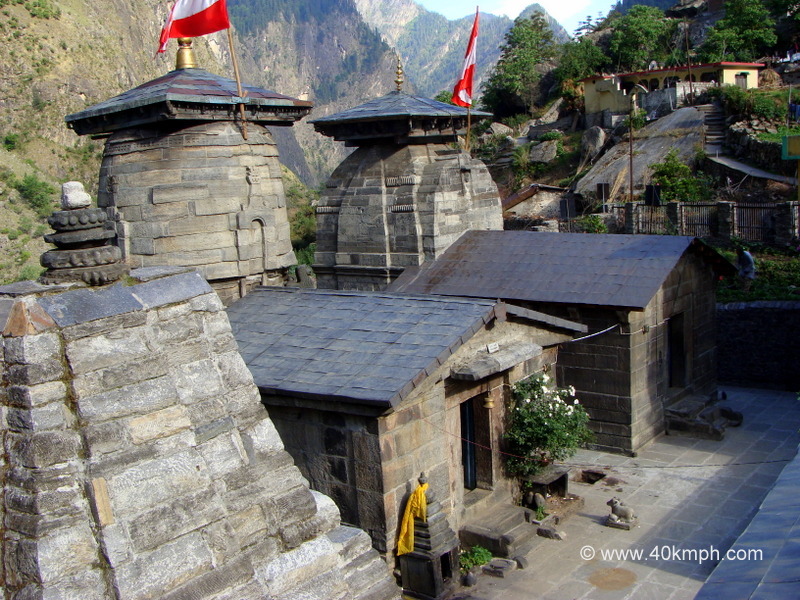 Badrinath visit was the original tour plan from Rishikesh but I have to stay for a night at Joshimath because next day I was meeting my tour guide. Next day after the meet we planned to visit Pandukeshwar first and then Badrinath. At 9:50 we started our journey from Joshimath by sharing jeep and 10:30 we reached Pandukeshwar. Joshimath to Pandukeshwar is 18 km approx. distance. Jeep fare Rs. 40 per person. Pandukeshwar is meditation place ofÂ king Pandu. King Pandu was the ruler of Hastinapur and is popularly known as father of Pandavas. He was a great archer. Once while hunting in forest he unintentionally killed a sage who was engaged in love in the form of a deer. The dying sage curse Pandu whenever he will make love with a woman he will die. To get rid of sage curse King Pandu arrive at this location and did tapasya (meditation). It is said Madri and Kunti queens of King Pandu also left Hastinapur. One day as Madri was taking bath in Alaknanda river king Pandu got attracted towards her and died due to sage curse. 10 months later Madri gave birth to two children named as Nakul and Sahdev and later committed Sati. The two brothers – Nakul and Sahdev were handed over to Kunti by sages and they went back to Hastinapur. Later during 12 years of exile in the forest it is said Pandavas visited this place and stayed and did antyesti (hindu funeral rites) of their father. It is also said Arjun did meditation at this location which made King Indra worried. He sent Pari (angel) to distract Arjun attention but nothing happened and at last Indra appeared and blessed Arjun. It is said Vishnu idol present at the temple is the one that was presented by Indra to Arjun. There are three idols in the temple – Lord Vishnu, Goddess Laxmi and Madri. All these idols are pratisthit (installed)by dharmaraj Yudhisthira. Actually there is a shivling inside the temple and above shivling these three idols are installed. Because in Kalyug devotees wont be able to tolerate the bright rays of shivling that is why Dharamraj Yudhisthira installed three idols on top of the same. Lord Shiva is the ancestors God of Pandu/Pandavas thus this place is known as Pandukeshwar. Next to the temple is another temple known as Vasudeva (Lord Krishna) temple also established by Pandavas. And another temple currently in building stage known as Laxmi Narayan temple. Why Yog Dhyan Badri the temple name – I ask the question. Because king Pandu was doing Yog (meditation) and Badri Narayan (Lord Vishnu) appeared and blessed Pandu. And festivals – I ask another question? There are two festivals at Yog Dhyan Badri temple. One is ‘Devwar’ the day Kuber ji and Udhav ji leave Yog Dhyan Badri temple for Badrinath and other festival day is when Kuber ji and Udhav ji arrive. Note: Badrinath opening date is decided by Tehri Maharaj’s Guru on Basant Panchmi day and closing of Badrinath temple during winter days is decided on Vijayadashami. Knowledge enhanced. Thank you said I. Thanks a lot. After visiting Yog Dhyan Badri temple and spending one night at Pandukeshwar next day we started our journey towards Badrinath but to find one sharing jeep was extreme difficult. No jeep owner or driver was ready for Badrinath because they were saying while returning they won’t get passengers for Pandukeshwar. At last we found one jeep driver but from Pandukeshwar to Badrinath he charged Rs. 100 per passenger. The distance between Pandukeshwar to Badrinath is approx. 20 km. 8:40 we started our journey and by 9:35 we were at Badrinath. Many times I think to re-start motorcycle journey but then I think am I traveling for myself only or I am traveling for self and for tourists who wish to visit Uttarakhand. Local conveyance mode one of the best.